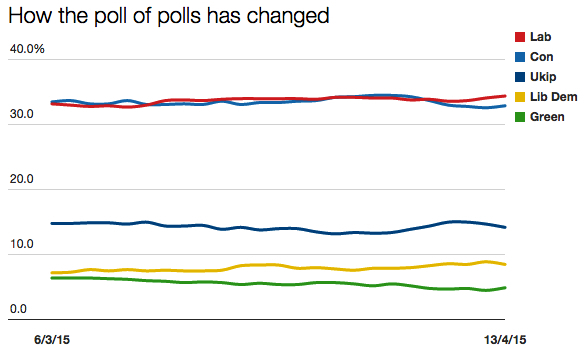 The monthly poll averages for the two of the four main parties are on the move. Not by much, admittedly, but after several months of almost no movement at all, any sign of life feels significant. The Liberal Democrats are back above 8% for the first time since August 2014. It’s a tiny change, yes, but their current average of 8.3% is 0.7 points higher than last month. Labour is also up on last month. Its current average of 34.1% is the highest the party has seen since September 2014 and represents a 0.6-point increase on last month. Again, it’s a very small change, but as with the Lib Dems it’s a) in the right direction and b) comes after a long period of little movement of any kind. The poll of polls shows Ukip dipping in the past week or so – something that’s not so evident in the monthly average, which is currently 14.2%. 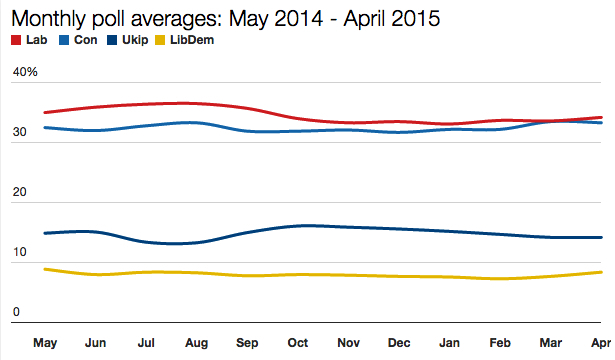 As for the Tories, their monthly average in April so far is 33.2%: 0.2 points down on March. As always, these and other poll trends tell their own intriguing story, but it’s one that’s likely to have very little bearing on the actual election result. What it continues to do, however, is provide a narrative for the campaign that manages to be both mesmerising and maddening. And with three-and-a-half weeks still to go, those sentiments are likely to get only more extreme. LDs usually gain momentum during campaign and I believe they will continue to do so this time but still narrowly finish fourth in voteshare. ICM reckons that the Lib Dems will do better than the polls are suggesting because a number of those who intend to vote for them are “shy” about declaring themselves (as happened with the Tories polling below their actual strength in the 1990s, especially at the 1992 General Election). Which seat is being contested by the most number of candidates?